Gold bullion is a real, tangible asset…and arguably, the best form of currency the world has ever known. In times of economic or social crisis, gold is a safe haven. Gold is convenient as it is rare, durable and can purchase a goods and services globally in small amounts. It is globally recognized, and can be easily traded throughout the world. Since ancient times, gold has been a prized material and has endured as one of the most secure means of preserving one’s wealth and maintaining purchasing power. A gold bar’s beauty is in its ability to diversify investment risks and protect substantial amounts of wealth. Gold is a unique investment, one that has endured as mankind’s most widely recognized trading commodity for over thousands of years. From the times of ancient civilizations to our modern are, humanity has been fascinated and drawn to the allure of gold’s shiny luster, and have universally endowed it with the power to alter the very course of history. International Bullion Exchange offers Precious Metals IRAs and other investment options including investment grade coins and diamonds, gold and silver bullion, as well as other precious metals based products. With the level of uncertainty in today’s economy and global political atmosphere, the demand for gold, silver, platinum, and palladium have all been growing at record rates, with demand fueled by investor demand as well as industrial and manufacturing high and mid-tech products. With exploding deficits in the US and other G8 countries, one needs only to look at history to find that governments when faced with huge amounts of debt ultimately print massive amounts of new money and inflate their economies so they can pay off their debt with cheaper dollars, sterling, Euros, etc. 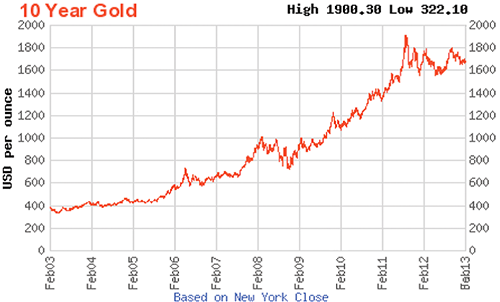 Historically, as paper assets have collapsed in value, gold and precious metals have skyrocketed in price.